Blood clot. 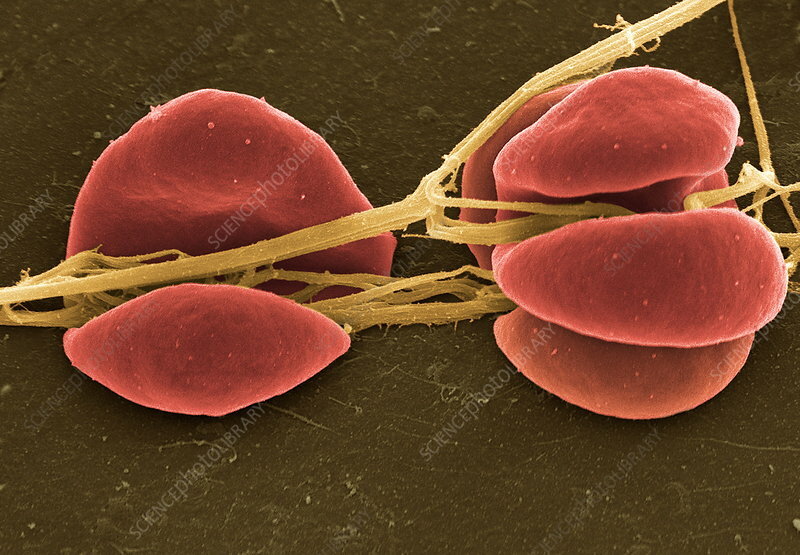 Coloured scanning electron micrograph (SEM) of fibrin strands immobilising and, in the process, distorting red blood cells (RBCs). RBCs, or erythrocytes, make up 99% of the cells in blood. They carry oxygen around the body and their unique surface shape (biconcave) maximises the amount carried. If damage occurs to a blood vessel, a protein found in blood called fibrinogen will be converted to fibrin, an insoluble protein. Fibrin molecules make a tangled net of fibres which immobilises the fluid portion of blood and also traps the RBCs. Along with the action of platelets, this is sufficient to prevent a dangerous loss of blood. Magnification not known.